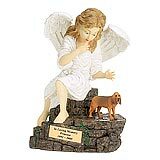 "First of all, I would like to thank you for taking time out to contact me in making sure that Goldie's memorial arrived safely. Thank you and your company very much also. It really is an exquisite piece and my whole family thought it was a beautiful and fitting tribute to Goldie. When I was ordering it, I didn't realize it would be so large! But I am glad it is because I figured that this was the last thing I would ever be able to do for Goldie and I wanted to spare no expense for her. Thanks very much again and in the future I will refer others who have lost their pets to your company." 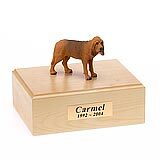 All available Bloodhound dog urns and memorials will be displayed with the figurine on the Bloodhound urn you select and in the appropriate size.